Our PCC 'Friendly' team had an unfamilier look about it today at Blewbury but the hosts' hospitality was as everything that we have come to expect from our good friends. Dorothy Elliott, Phillip Allison, John Hale and the 'in form' Bob de Board, all made their team debuts along side 'second starter' Paddy Bunch and all performed admiralbly. Pauline Wood, Don Rutherford and Chris Roberts made up the reast of the team who were edged out 9.5 to 6.5 on a very hot and enjoyable afternoon. 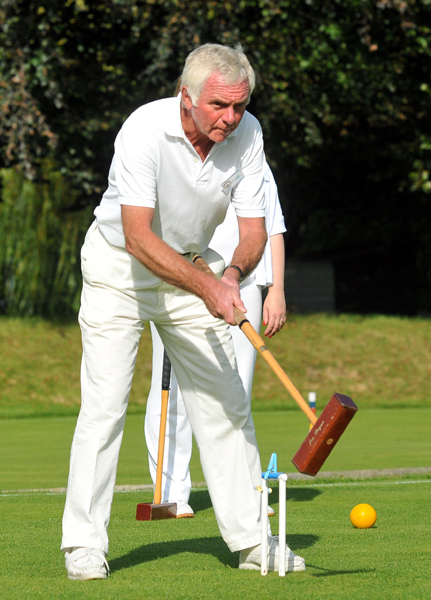 3rd September - There's nothing between Croquet & Bridge! 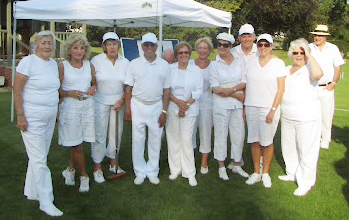 The annual Croquet v Bridge match ended as a draw for the first time today. 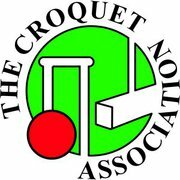 Five pairs from each of the Croquet Club and the Bridge Section contested the event that began with a morning 5 table pairs duplicate bridge session, scored in the usual fashion but then converted into points out of 25; the Bridge Section emerging as convincing winners by 17 points to 8. 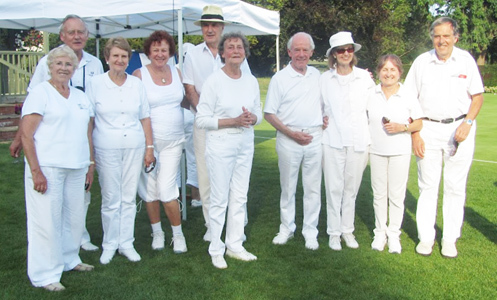 At an enjoyable sandwich lunch on the club terrace the bridge side were reasonably confident they could hold on to win but expected the Croquet team to fight hard to narrow the gap in the afternoon. 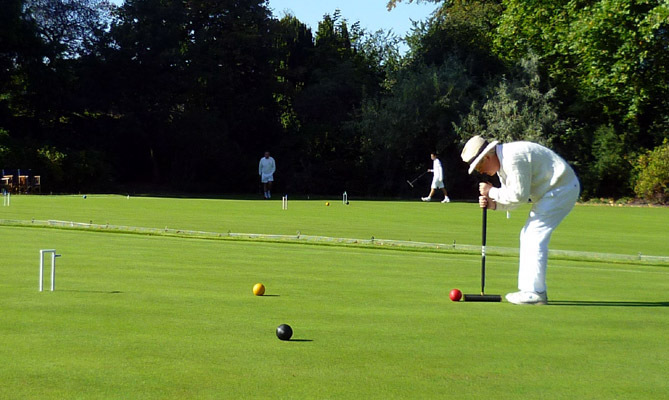 The croquet got underway in perfect weather and, as expected, the catch-up began; it soon became clear that it would go right to the wire and, in fact, the result came to rest on the last 3 games where Bridge needed just 1 win to survive. But it wasn't to be and the final result was a draw at 25 points each! 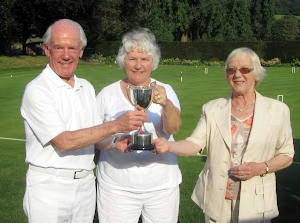 Mrs Janet Anstis, the Chairman of the Bridge Interest Group kindly presented the Ralph Connell Cup jointly to Robin Morrell and Pauline Wood, representing Bridge and Croquet respectively and all agreed it was a most enjoyable day ending in a just result. 6th September - It's All Happening! Our AC Autumn Singles Tournament gets under way tomorrow at 1000, whist at the same time, so dose a GC Cup Final! 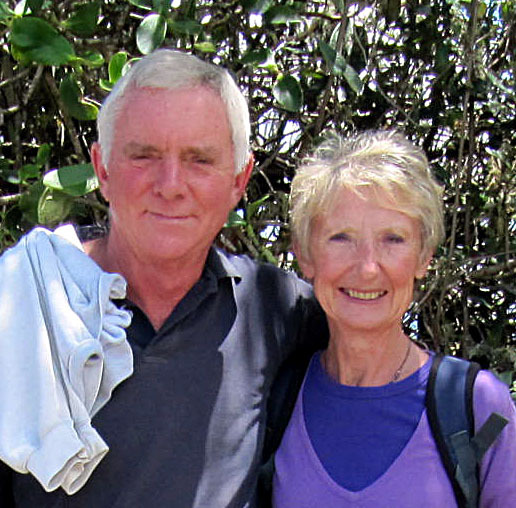 Family honour will be at stake when the Morrelles (Robin & Suzanne) take on The Norrises (Ian & Delia) at 1000. And its a big few days for Ian who will be in another final, this time the 5+ Singles, against former winner John Chalfont at 1700 on Monday. Delia & Ian Norris were pused all the way to three games by Suzanne & Robin Morrell, but they eventually secured the Doreen Belsen Cup this morning. Two very long games that both went to the 13th, preceded a 7-3 third game result, that showed just how close this match was. 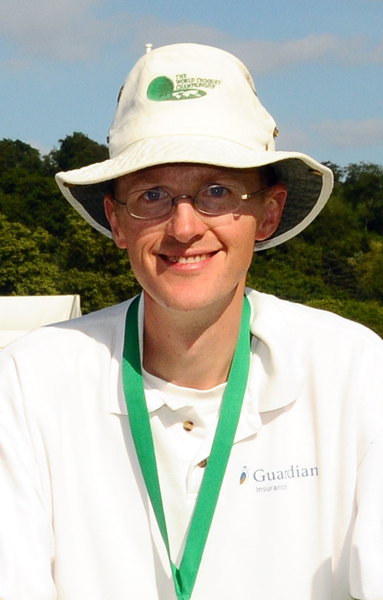 overcome the experienced John Chalfont in the 5+ Singles final at 1700 on Monday. from two; a feat matched by Brian Bucknall as the pair head their respective blocks overnight. The Tournament concludeds tomorrow with the final expected to start at 1400 and finish on or before 1700. Chris Roberts snatched victory with the last turn of the final game of the AC Autumn Singles Tournament today. Behind for the whole game, Roberts needed a trickey 'hit in' and then to make 3 hoops to tie with Brian Bucknall who had been well ahead thanks mainly to an impressive 10 hoop opening break. The two were undefeated in their block games ahead of a field of eight but it all boiled down to the last few minutes; Roberts 'hit in' was achieved, but in the process he scored an extra hoop for Bucknall, so the target went out to 4 hoops for the last break of the game. Roberts made slow but steady progress, pausing for a count up at one ahead and then added the insurance of another hoop, to win '+2 on time' and retain the Caversham Plate. In the junior event, Raghu Iyer outscored Pauline Wood and Margaret Broughton to secure the Zai Sterling Cup. It was lovely to have the support of former chairman Ken Cotterell for the whole day and for him to present the trophies. Charlie von Schmeider (pictured, right) beat Chris Roberts again in the GC Open Singles Competition final this afternoon. As in their previous two Final enconters, it went to a third and deciding games and just like two years ago it was all on the last 13th hoop. Birthday Boy Roberts caught von Schmeider cold to take the first game 3 - 7, but this sparked the no.1 seed into action & he wraped up the second impressivly 7 - 1. The third was an exceptionally long game and eventually Roberts needed all three of the last hoops. After much prevarication Roberts ran the 11th so well that he nearly scored the 12th too, but then won that hoop anyway after a few exchanges and so to the final hoop. Von Schmeider eventually nestled in the hoop and set Roberts an unlikely jump shot from the boundery which he got airborn with but lacked direction. And so the familier tale of a match going to the wire was repeated again and von Schmeider won his third title in a row over Roberts, 4th in a row total, and 5th title in 6 years. Following on from a weekend of tight games, this morning, Frances Colman defeated Elizabeth O'Dair by one hoop 'on time' to win the AC Knock-out Cup. In a game of few breaks that was even throughout, the game was tied with just five minutes to go before Colman pulled the crucial single hoop clear. Michael Wiles (pictured right) ended an impressive 4th at the CA National Centre Stage Final today and he reduced his handiap down to 4 in the process. Whilst reporting that the courts at Northampton C C were much better than last season, Micheal said that he won 4 out of 5 block games but lost out in the 3rd/ 4th pay-off. 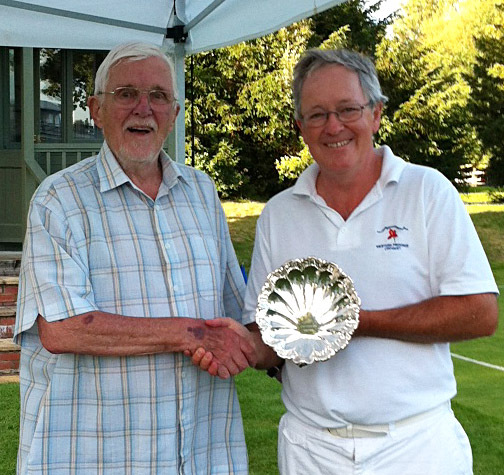 The other PCC players Heather Masheter and Hugh Crook faired less well unfortunatly, but it's 'hats off to Micheal for his achievement. Though short on detail at the moment, the hot news is the Ian Norris (pictured left) defeated John Chalfont 2-0 to secure his second Competition Title of the season today. 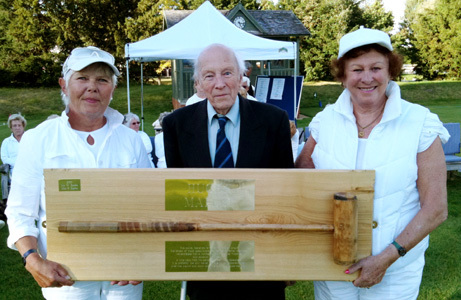 Dorothy Elliott & Helen Fensome won 'Hugh's Mallet' from the man himself, Hugh Spencley, at our third Drawn Partners Tournament yesterday. Helena was really on song, hitting everything and running long distace hoops with nonchalant ease and Dorothy played at her steady best too. With several players crying off very late, which was very tedious, Helena answered an emegency call to fill a void and actually raced from ber bed to be on the courts in the nick of time, but even then we were one pair short leading to 'sit outs' for 6 players. Members are reminded that these tournaments are designed to keep every one occupied and late withdrawals disrupt your fellow players' enjoyment. Back at the croquet, its was all very 'fishy' (but not in a suspicious way), with pairs given marine life nicknames for the day. 'Dover Sole, Haddock, Jellyfish and Piranha' (Margaret Crook & Don Rutherford, Dorothey & Helena, Raghu Iyer & Paddy Bunch, Mary Chambers and Mike Fensome respectivly) won their morning blocks, and the likes of table favorites 'King Prawn, Lobster and Fish Finger' fell by the way side. The afternoon knockout and repocharges followed the now familier format, leading to an uneven sounding final battle between 'Haddock' and 'Piranha'. Despite Mike Fensome's now excellent tactics, thinking many shots ahead, he and partner Mary Chambers couldn't match the accuracy of Dorothy and Helena. Helena will be hoping to carry forward her good form over the weekend when she competes in a Phyllis Court dominated Oxfordshire team at the Inter Counties GC Championships at Southwick, Brighton. Oxfordshire Team: Charlie von Schmieder, TJ Johansen, Chris Roberts & Helena Fensome (all Phyllis Court) and John Spiers (Surbiton). PCC 'A' rounded off their South-East Federation League programme with a defeat at Dulwich today, going down 5.5 to 1.5. 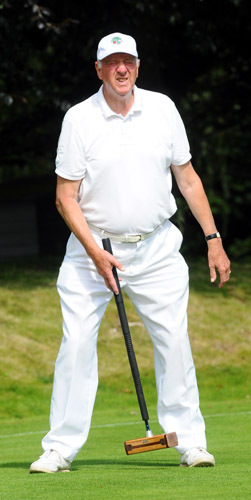 Mike Fensome (handicap 4) did very well against two 3 hanicappers, beating one 2-1 and then taking the other to the last hoop of their third game before being edged out. Tacticaly, Mike's game now shows a marked improvement and clearly he has benifeted from exposure to these tough games, which was precisey why we entered the S-E Fed. League in the first place. Raymond Wood (HC4) is playing sharper too these days and he played the same two players as Mike, scoring a 'half' with a 1-1 draw in his first rubber (the decider of which remained un-played) but losing the second tie. Chris Roberts (HC1) & Helena Fensome (HC2) had a more difficult time, losing their singles against a 'scratch' (2-1) and 2 handicapper (2-0) respectivly after getting on the losing end of the doubles too. 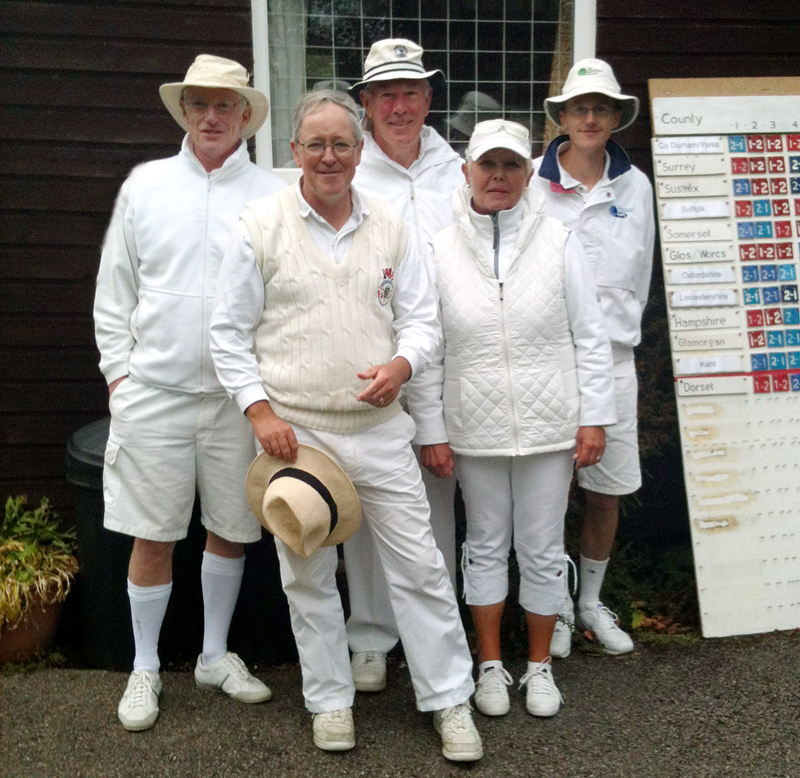 Phyllis Court players dominated the Oxfordshire team that were runners-up in the GC Inter-Counties Championship at Southwick, Brighton yesterday but fell just short by one match win. They made a terrific start on Saturday that saw them as joint leaders overnight along with Kent and Glamorgan, and this was such a turn aroungd from the low finishing position of last season. 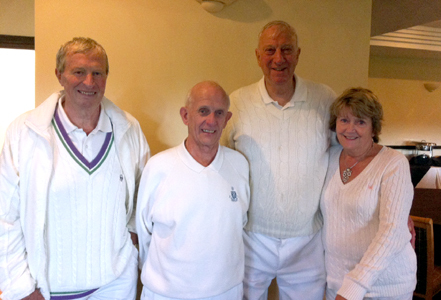 TJ Johansen (1) lead the team of fellow Phyllis Court players Chris Roberts (1) and Helena Fensome (2), and county stalwart John Spiers of Surbiton (1) completed the line-up. Charlie von Schmeider (1), also of Phyllis Court, boslstered the team on Sunday, which saw Leicestershire came into the fray to finish third just behind Oxon, by dint of one game win achieved in the very last round. But in the end, everyone conceded to Kent as the best team and worthy winners. Our Phyllis Court 'Friendley' team beat Eynsham this afternoon. Delia Norris announced her debut in perfect fashon by winning all of her games! 18th September - "Didn't we have a lovely day, the day we went to Dogmersfield"
Where? Dogmersfield. It's a small village between Basingstoke and Farnborough and their croquet club play in the grounds of a rather fabulious country house which is now a five star hotel and spa. Formed just 5 years ago, Dogmersfield are the youngest of the Southern Federaton Clubs, and our reciprocal visit there today followed the first match between our clubs at Phyllis Court last season. Though delightfully set in an enclosed garden, the Dogmersfield court is barely half size but nevertheless provided good entertainment for Chris Roberts, Frances Colman and Raghu & Joanna Iyer (the latter playing her first representative match for PCC). We duly won more of the matches, but all that was forgotten over a magnificent high tea with home made scons and cakes as far as the eye could see. - Just a lovely day. Delia & Ian Norris have done it again! Won another competition that is. News has just reached us that they were pushed to three close games by Mary Gaynor & Don Rutherford, but triumphed in the final of the 5+ Doubles. This latest success comes hot on the heels of their securing of the 7+ Doubles crown and Ian's prowess in the 7+ & 5+ Singles Competitions - Very well done the pair of you! 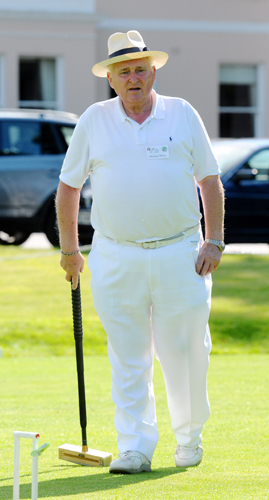 Chris Roberts (Phyllis Court) will be boring everyone sencesless all winter with the tale of his shock defeat of five time World AC Champion, Robert Fulford at the English National GC Championships (aka.The Ascot Cup') at Hurlingham this weeknd. Raymond Wood and TJ Johansen (pictured far right) took the last remaining Club competition title, the Open Doubles, with victory over Charlie von Schmieder and Bob de Board today. They made a great start to win the first game 7-1 but then some errors crept in and they found themselves 1-4 down, before clawing back to 6-6. Having played the whole match from beneath shared umbrellas, there was relief when Johnasen's winning shot scored on the 13th hoop to wrap int up in straight games. 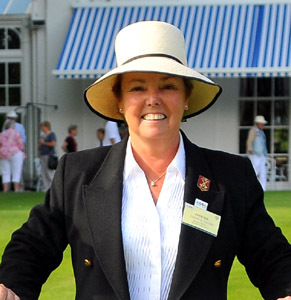 Frances Colman (pictured right) took charge of the All England GC Handicap Finals at Colchester this weekend for the Croquet Association. 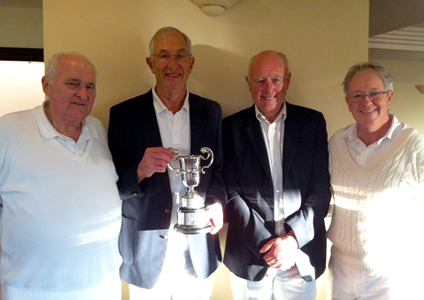 Phyllis Court Association team score a splendid victory over Littleton to win the Handicap League Final yesterday. However, our PCC'B' team couldn't match that in the GC final and went down badly to Hamptworth. 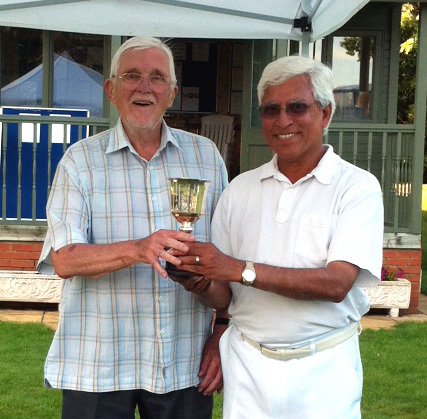 The two SCF Handicap League Finals were played side by side on Hamptworth's excellent & fast courts, and the first to finish were the GC players. PCC 'B' were all square 2-2 at lunchtime but that preceded an uncharacteristic slip from our hitherto undeafeated team and Hamptworth sprited away to 7 singles successes and an impressive 9-3 victory. In the AC, it couldn't have been more different, as Phyllis Court took a commanding 3-0 half time lead into the four singels games that remained. Harry Midgley then added the crucial fourth win to secure the title, which was just as well, because Littleton fought right back to take the other three rubbers. So that one eneded 4-3 to a relieved Phyliis Court team, who duly qualify to represent the SCF in the National Secretary's Shield competition in 2013. Frances Colman presented both trophies on behalf of the Southern Croquet Federation, also managed both Finals, refereed and was 'duty photographer' to boot!